Afternoon school for the underprivileged girls of ages 5-15. Providing nutritional meals, books and notebooks, stationery, clothes and shoes for both summer and winter to the girls attending the afternoon school. Classes on English speaking, health and hygiene, personality development, etiquette and proper behaviour etc. for the girls. Tailoring classes for older girls and mothers. Classes on balanced diet and cooking of nutritional meals. Art and Craft classes for the girls from time to time. 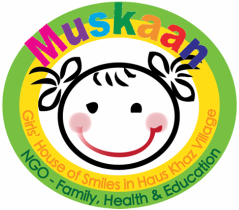 Regular Medical Clinics and Dental Examination for check-up of the girls attending Muskaan. Medical and Vaccination camps in Hauz Khas Village and Mayur Vihar Yamuna Khadar aimed at prevention of infectious diseases. Distribution of rice and pulses to the underprivileged people of such areas. Organizing clothes collection drives for distribution to the needy. Raising awareness about cleanliness and proper sanitation for prevention of diseases.